The south Clearwater Bay Peninsula in the south-east corner of the New Territories is a relatively unspoiled area with hills, country parks and rugged coastline. 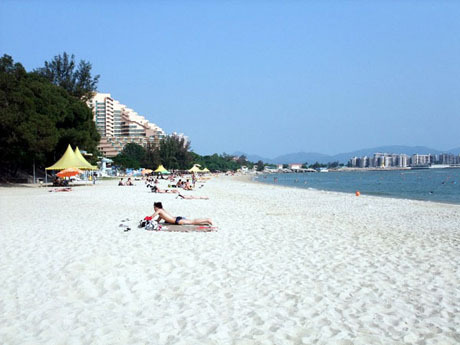 Clearwater Bay First Beach and Clearwater Bay Second Beach separated by a short stretch of rocky coast are both popular beaches with good facilities in a sheltered bay overlooked by wooded hills and peaks and the southern end by Clearwater Bay Golf and Country Club. The smaller but more secluded of the two beaches has rather coarse sand and shingle and is reached via a long flight of steps. Facilities include changing rooms, showers, toilets, raft and BBQ area. Lifeguard service operates from April to October and there is a shark prevention net. A short stretch of fine sand with good facilities including changing rooms, showers, toilets, raft and refreshment kiosk. Lifeguard service operates from March to November and the beach is protected by shark prevention net. GETTING THERE – Bus 91 from Diamond Hill Bus Station (under Plaza Hollywood next to Diamond Hill MTR Station) terminates at Clearwater Bay Second Beach. Service frequency every 17 to 20 minutes. Journey time about 45 minutes. Bus stop Clearwater Bay First Beach is the stop before reaching the terminus at Clearwater Bay Second Beach. The two beaches are connected by footpath and steps which takes about 15 minutes to walk. Green Minibus 103M from Tseung Kwan O MTR Station (every 13 to 20 minutes) also terminates at Clearwater Bay Second Beach. Journey time about 15 minutes. Located in the Sai Kung East Country Park Tai Long Wan undoubtedly has Hong Kong’s finest beaches in an area of outstanding scenery and those visitors able to make the effort of making the difficult journey to this remote location which is along the path of the MacLehose Trail will be well rewarded. 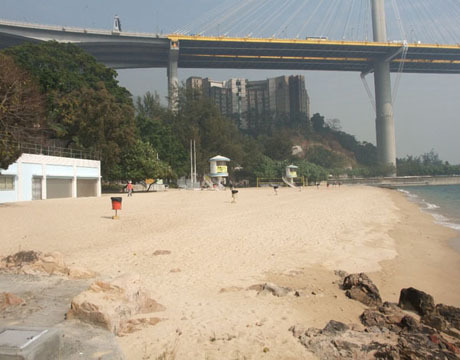 The beaches at Ham Tin Wan and Tai Wan are separated only by a short tree covered outcrop. Both are idyllic beaches with glorious stretches of fine silky white sands backed by swamps and overlooked by forested hills and the towering Sharp Peak in the distance. 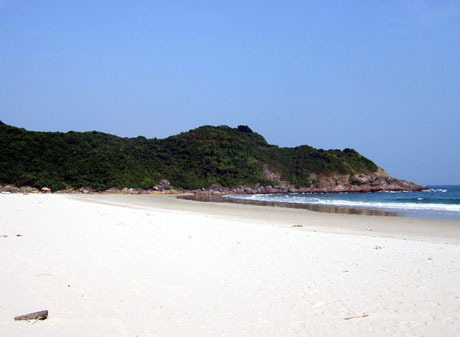 The beaches which look out over two small “twin” islands of Tai Chau and Tsim Chau are often almost deserted on weekdays. 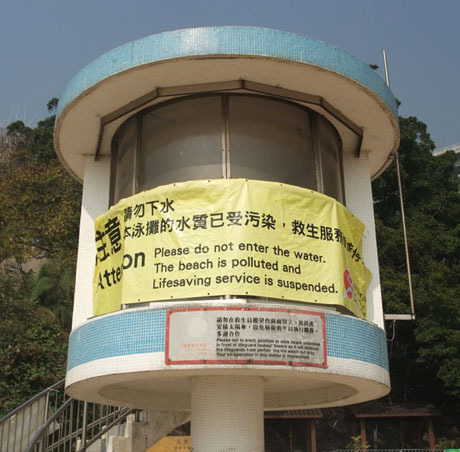 None of the beaches at Ham Tin, Tai Wan or Sai Wan are gazetted beaches (managed by the government Leisure and Cultural Services Dept) and there are no lifeguard services or shark prevention nets. GETTING THERE - This is a remote beach which is difficult to reach for the casual visitor. 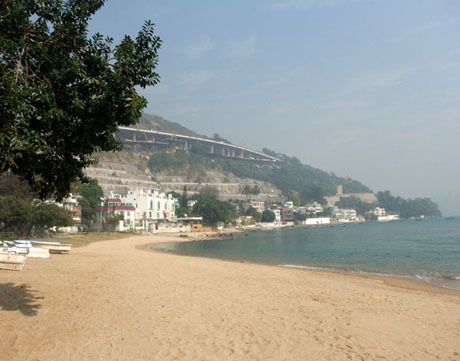 To visit the beach from most parts of Hong Kong usually requires a full-day excursion but is a good opportunity for visitors who enjoy walking to explore this area of outstanding scenery. KMB BUS SERVICE 94– take bus 94 (destination Wong Shek Pier) from Sai Kung Bus Terminus* to Pak Tam Au in the Sai Kung East Country Park (bus stop names are displayed in the bus – journey takes about 25 mins). 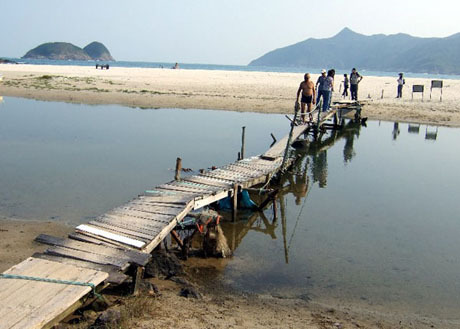 From Pak Tam Au follow the MacLehose Trail east to Ham Tin Beach at Tai Long Wan. The trail is well signed and is concrete path and steps all the way. The walk takes about 90 minutes and there are a couple of strenuous uphill stretches. As an alternative there is an occasional ferry service from Wong Shek Pier to Chek Keng on the MacLehose Trail or speedboat operators often tout for business and will take visitors to Chek Keng. From Chek Teng to Ham Tin the walk takes about one hour. SAI WAN RESIDENTS BUS SERVICE 29R- There is a minibus service from Sai Kung Chan Man Street (outside McDonald’s) to the pavilion at end of Sai Kung Sai Wan Road above High Island Reservoir in the Sai Kung East Country Park enabling visitors to get as close as is possible by public transport to Tai Long Wan and its beaches. This comfortable bus with leather seats has a capacity of 29 passengers and the one-way fare is HK$17. Octopus Card is accepted. The service is available for the public to use as well as villagers living in the remote village of Sai Wan and is popular with hikers. The journey takes about 25 minutes and the bus is one of only a few authorised vehicles allowed to use Sai Kung Sai Wan Road. From the pavilion where the bus terminates is a 2.2km walk (about 30 mins) along a well maintained concrete path to join the MacLehose Trail stage 2 at Sai Wan Village with the bay and beach just beyond. 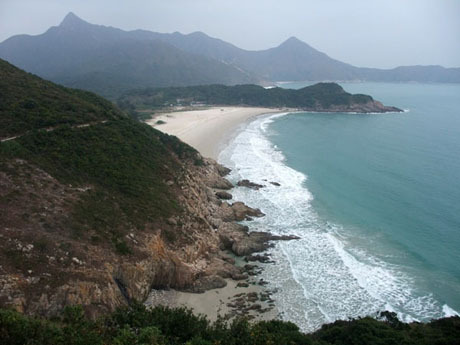 Sai Wan is the southernmost beach of Tai Long Wan and the beaches of Ham Tin, Tai Wan and Tung Wan can be reached by following the MacLehose Trail northwards along the coastline and occasionally over steep headlands. On Mondays to Fridays departures from Sai Kung are at 8-30am, 9-15am, 11-30am and 3-30pm and from the end of Sai Wan Road at 9am, 9-45am, 12 noon and 4-45pm. On Saturdays, Sundays and public holidays departures from Sai Kung are at 8-30am, 9-15am, 11-30am, 3-30pm, 4-15pm and 4-45pm and from the end of Sai Wan Road at 9am, 9-45am, 12 noon, 2-15pm, 4-45pm and 5-30pm. *To get to Sai Kung take bus 92 from Diamond Hill MTR Station, bus 792M from Tiu Keng Leng MTR Station, bus 299 from Shatin or Green Minibus 1A from Choi Hung MTR Station exit C2. Whichever route is chosen in hot weather visitors should take plenty of water to avoid the risk of dehydration. 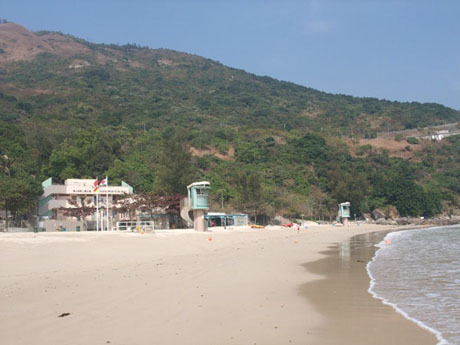 Golden Beach is the most easterly of a series of beaches in Tuen Mun, all being within a short distance of each other. Cafeteria New Beach immediately adjacent to Golden Beach has a beach volleyball court which is sometimes used for practice by the Hong Kong Volleyball Team. 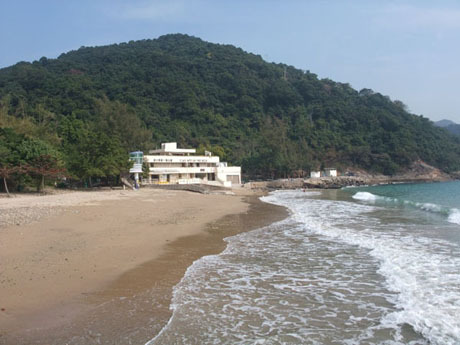 The other beaches are Cafeteria Old Beach, Kadoorie Beach and Castle Peak Beach all of which are good beaches with good facilities and within walking distance of Golden Beach. GETTING THERE – Golden Beach is located on Castle Peak Road (possibly Hong Kong’s longest road stretching all the way from Kowloon to Yuen Long) and is served by the bus stop “Hong Kong Gold Coast” (display panels inside the bus show next bus stop names). There are direct bus services to Golden Beach by Citybus service 962 from Causeway Bay (Moreton Terrace Bus Terminus behind Hong Kong Central Library) via Causeway Bay, Wan Chai, Admiralty, Central, Sheung Wan and Western Harbour Tunnel. Buses run at approx 15/20 minute intervals. There is a less frequent service by Citybus service 962B from Admiralty (West) Bus Terminus. The journey from Causeway Bay to Golden Beach takes about 70 minutes. Hong Kong Gold Coast/Golden Beach is also served by KMB route 53 from Tsuen Wan Nina Tower Bus Terminus close to Tsuen Wan MTR Station via Castle Peak Road and KMB route 61M which can be boarded at various points on Castle Peak Road in Tsuen Wan including outside Tai Wo Hau MTR Station. Alternatively from Tuen Mun MTR Station feeder service K51 serves Hong Kong Gold Coast/Golden Beach and from Castle Peak Road in Tuen Mun Town Centre buses 53, 61M, 52X also serve Hong Kong Gold Coast/Golden Beach. From Tuen Mun the journey to Golden Beach takes about 10 minutes. 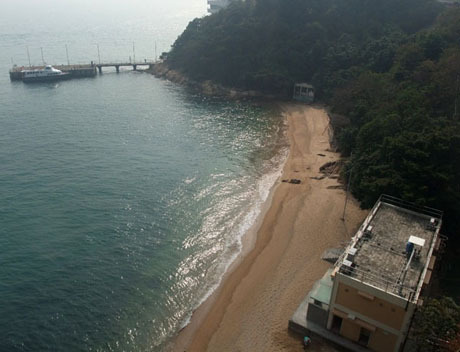 In late 2010 it was announced that seven beaches west of Tsuen Wan, along the Rambler Channel, which were officially closed between the mid-1990's and 2003 owing to contaminated water are to be reopened. Installation of a water treatment plant at Sham Tseng and replacement of leaking septic tanks with a new sewage system serving the villages along Castle Peak Road has led to a dramatic improvement in water quality. 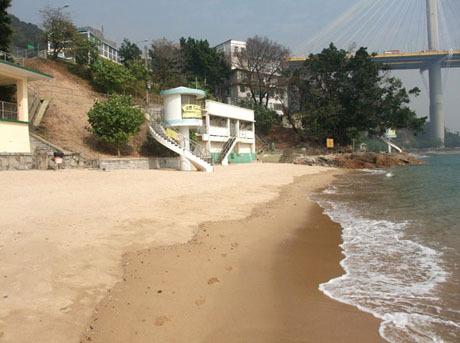 Four of these beaches, Lido Beach, Casam Beach, Hoi Mei Wan Beach and Approach Beach reopened in June 2011, Angler's Beach reopened in 2013 and lifeguards have returned to these beaches in the summer month. 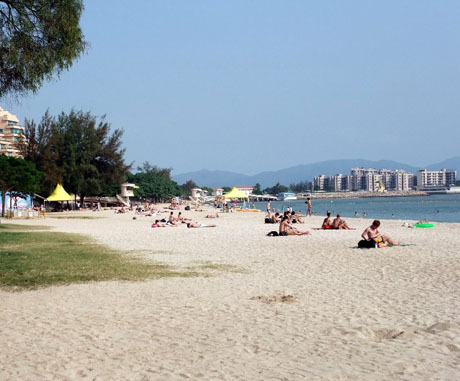 Although water quality has also improved at the remaining beaches, Gemini Beach and Ting Kau Beach, these beaches require improvement works as existing facilities are inadequate. They are expected to reopen by 2014 after changing rooms and other facilities have been built. More details regarding reopening of these beaches will follow when available. 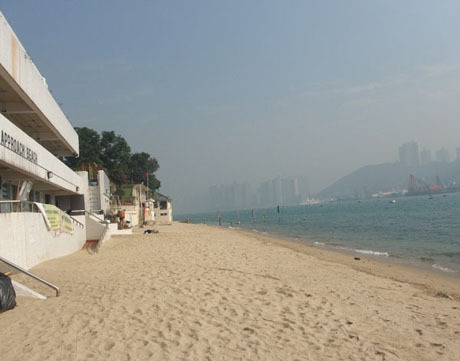 GETTING THERE - These beaches can be reached by bus routes serving Castle Peak Road including KMB services 53 (Tsuen Wan West Railway Station - Yuen Long East), 234B (Tsuen Wan West Railway Station - Sea Crest Villa) and green minibus 96M (Tsuen Wan West Railway Station - Sea Crest Villa).